This Award, initiated in 1992, is decided annually and usually presented at the conclusion of the Mayoral Year. The Award for Service to the Community is designed to recognise the efforts of individuals or groups who contribute to the town of Maldon. Those eligible include individuals, groups, charities, sports & social clubs, community associations, associations for the disabled, churches, schools, youth organisations, etc. In recent years this has been presented at the Annual Town meeting. 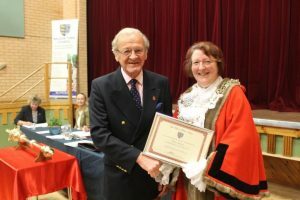 In 2018, Sholto Morton was the Town Mayor’s Award Winner for Community Service, for masterminding the poppy collection in Maldon on behalf of the Royal British Legion for many years. 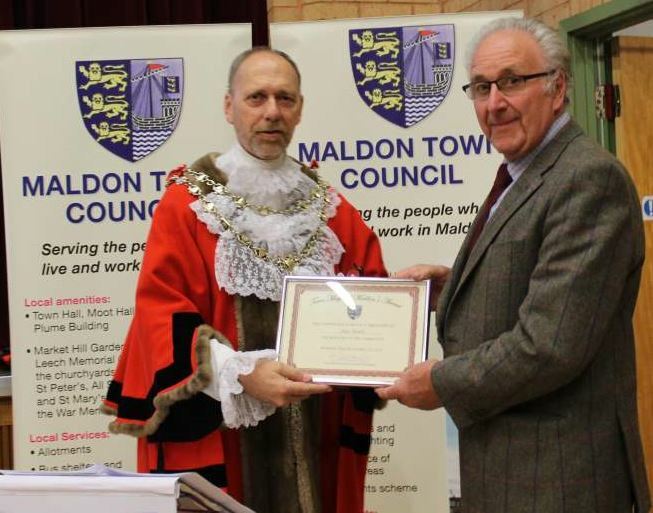 In 2017, the Mayor’s Community Service Award was given to the Maldon Mens’ Shed who provide skills training and companionship for local men. In 2016, Alan Smith was the recipient of the Mayor’s Community Award. Alan has been a member of Maldon Rotary Club for many years and has been its President three times. He is a hardworking volunteer and is involved with Maldon Mud Race and the Annual Rotary Fireworks and also takes on the role of community Father Christmas. He helps to raise considerable amounts of money that is given back to the community. Alan is a tireless worker who serves on various committees and is a volunteer driver for Viking Support Group. He visits and takes people to hospital.